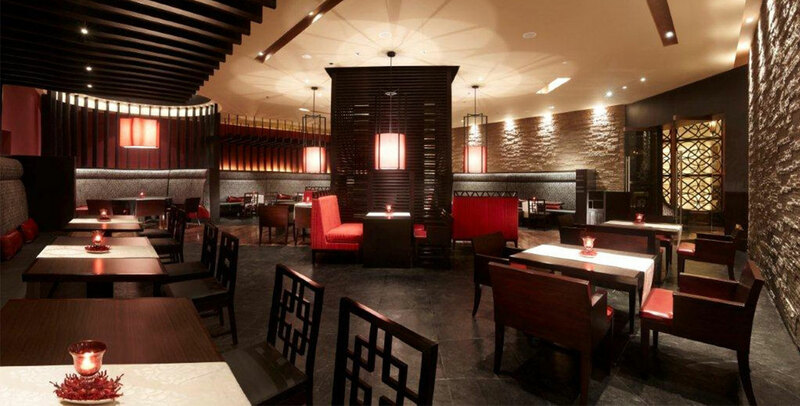 Brief: Design of a restaurant within the Vivanta by Taj Surya Hotel serving a contemporary take on traditional Chinese cuisine. Concept: Dim Sum is an outgrowth of its contemporary take on traditional Chinese cuisine and the mood or theme is that of an elegant and contemporary interior “street” or modern hutong, featuring both vertical and horizontal trellis elements with intricate wood joinery, and a palette of natural materials with slate stone floors in main circulation areas, inlaid wood plank paths and stacked ledge stone walls. Rather than creating interiors with a specific historic style, we have incorporated traditional organizing devices such as symmetry and hierarchy into an overall contemporary theme and utilized artifacts to allude to history and tradition in the overall design.Hidden light sources reveal texture and color throughout the space while lantern like decorative fixtures complete the ambience of this contemporary dining experience.